Our Thousands Strong Campaign has ended. Please visit http://www.livingsongproject.org/ to make a contribution. What is Living Song Project? Living Song Project will be an online, searchable database of art songs by living American composers. We've done all the research, and currently there are over 6,000 songs by over 500 composers represented. These numbers will continue to grow, making Living Song Project a powerful resource for singers, pianists and composers! I frequently hear from students: “I’d like to program songs by a living composer on my degree recital. Where do I look?” It’s not an easy question to answer. There are many classical singers who want to sing art song, as well as plenty of composers writing it. The problem is that there’s no central resource to discover what’s out there. This is especially true as the landscape of the music publishing industry continues to change dramatically. This is why we created the Living Song Project. This project has received enthusiastic praise from some of the most important figures in our field – including Thomas Hampson and Marilyn Horne, each a champion of American song in his/her own right. Not only will this be an industry-changing, innovative, primary resource for future research; we envision it to also be an intersection where performers, composers and poets will meet. Today’s musicians crave social relevance and connection in their work. They not only want to perform new music, they also want to connect and interact with the music’s creator. Living Song Project will be a primary resource for recital programming, and will enable musicians and composers to interact in a new way. 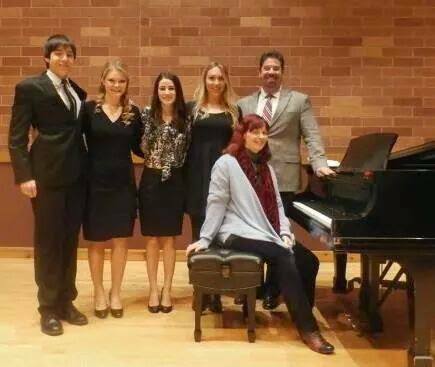 Guest composer Juliana Hall with OU students Austen Oatman, Courtney McPhail, Jennifer Koljack, Patricia Westley and Professor Joel Burcham after a master class of her songs. What makes Living Song Project unique? The advanced search feature allows users to select specific criteria for their search. If a soprano is looking for a song cycle of 10 minutes or less, by a female composer born after 1970, with poetry by Sara Teasdale, she would find it within seconds on Living Song Project. She would also find out where she can hear an audio sample, view a score sample, or purchase the score! No other Art Song resource exists with this kind of depth and flexibility. The best part is that composers will be able to add their own data to Living Song Project, bringing much more exposure for their works while keeping the resource robust and sustainable. We’ve spent the past year gathering and entering information, but need your help to make it available for use! Your donation will directly fund the development and deployment of this important web database. Join us in building a global community of composers, performers and advocates of contemporary American art song! Please SHARE this campaign with your social networks as a simple way to show your support! Katia Kotcherguina (MM Voice '15) singing songs of living American composer George Crumb during her degree recital. Don't forget to use your corporate match and help your gift go the extra mile! Simply follow these steps. 1) Confirm that your company offers matching. 3) When you receive your receipt, notify your company of your gift to be matched. 4) Contact elizabeth.avery@ou.edu with your match information and we will make sure your total gift, match included, will be reflected on our donor wall. Skye Singleton (BM Voice '15) performing music of living American composer William Bolcom during her Bachelor's degree recital. 100% of funds raised go directly to the project. If we raise our goal amount, we will be able to fully fund the website/database. If for some reason we fail to meet our goal, we will apply the funds raised to various stages of the website construction, and continue other forms of fundraising. Now for the exciting part: if we manage to exceed our goal, and we truly believe that we will, it would allow us to also develop a mobile app! your contribution of $10 will help us get the website designed just right! your $25 donation will go toward development of the necessary software. Put your hard hat on! Your $50 contribution will be used toward building the database structure. No bugs allowed! Your donation of $100 will ensure the software is bug-free at launch time! Ready to cut the ribbon? Your donation of $500 get us closer to the big day!